Diageo has announced its return to the Irish whiskey category with plans for a whiskey distillery in the old power station at St James' Gate, Dublin, in a €25m investment over three years. Further to this, Diageo is releasing a premium NAS blend, Roe & Co.
Diageo identified a clear opportunity in Irish whiskey to drive overall category growth via premiumisation. Responding to this, Roe & Co was created. Diageo claims that the brand has been created to reflect modern, contemporary luxury, in everything from pack to liquid, and with a focus of making Irish whiskey more prominent in Europe’s cocktail culture. 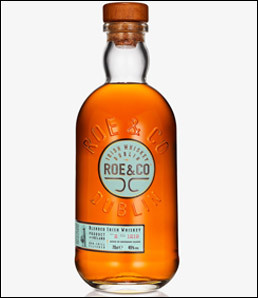 Roe & Co is made from hand-selected stocks of Irish malt and grain whiskies and aged in bourbon casks. Roe & Co is named in honour of George Roe, the once world-famous whiskey maker who helped build the golden era of Irish whiskey in the 19th Century. His distillery, George Roe and Co extended over 17 acres on Thomas Street in Dublin and was once Ireland's largest distillery. As neighbours for hundreds of years George Roe and Co and Guinness were the two biggest names at the heart of Dublin’s historic brewing and distilling quarter. Diageo will now build on this heritage with the creation of a new distillery by converting the historic former Guinness Power House on Thomas Street. The new St. James’s Gate distillery, will be situated shortly from where the George Roe and Co distillery once stood and subject to planning approval will begin production in the first half of 2019. Using her 30 years of experience, Diageo’s master blender, Caroline Martin, and her team sourced and selected stocks of Irish whiskies. Roe & Co is non-chill filtered and bottled at 45% ABV. The first blend of Roe & Co will be available in key European cities from 1st March 2017 as part of Diageo’s growing Reserve portfolio. Mary Mitchell O’Connor TD, minister for Jobs, Enterprise and Innovations, says: “It is great to see Diageo continue to invest in and further enhance the historical Dublin 8 area to create a fantastic attraction for tourists and locals alike. The proposed distillery will play a major role in the overall regeneration of the Liberties through the repurposing of the St James’ Gate Power House.